I really enjoy self improvement. I have one of those personalities that thrives on outside goals to motivate me to be better. Just left to my own motivation, things get pretty bad. I know that, I own that, so when I lack motivation I begin looking for that thing that will provide motivation for me. I have found that motivation in a backpack. I know that may sound silly, and it probably is. But that doesn’t matter. What matters is I’m striving to improve because of it. I’ll explain. A couple of months ago I began planning a trip to India to help serve orphans with an organization we support. This would be a 2 week long trip, adding a stop in Indonesia to see a friend and see the relief organization he works with in that country. I’ve never really enjoyed how I’ve packed for long trips, but I wasn’t sure there was a better way. So, I started looking around, as per usual, the internet is a vast place to get lost. I was wonderfully lost for 3 or 4 days during my free times looking at all the internet had to offer. (NOTE TO SELF: remember to thank Al Gore next time I see him for inventing such a wonderful place) This discovery process led me down two roads. The first is packing light. As light as possible. Not taking half as much as you intended and then halving that again. The second road was challenge events. Both of these were the motivation I was looking for to improve myself. I think the company that helped me see both of these most clearly was a company called GORUCK. I liked their gear. They don’t apologize for building incredible stuff and they stand behind it. The flagship of their fleet is the GR1, read about it here, and it is not cheap in any aspect. It is understated, multi-use, and ready for anything, which makes me like it. I’m also drawn to the quirkiness of the company’s founder, Jason, it’s endearing to me. They also do events. These events serve two purposes for the company. 1. “We are building a bridge between the civilian and military worlds.” These events are led by special forces types who are striving in an effort of 2. “building better Americans,” by showing them the power of a team and how much more they are capable of as a person. Those two thing appeal to me immensely. One of my best friends is former military and that gap needs to be bridged. I’m a team guy through and through and love the concept. And I think most organizations should help in the cause of building better Americans… if not simply better humans. So, I bought a backpack and signed up for an event. I also got 5 or 6 of my buddies to sign up too, because they could use a little improvement as Americans as well. Just don’t tell them I said that. I’ve started my training and I’m sure I’ll chronicle my event in a month when it is done. I’ve also started changing the mindset of how I pack. I found another great website called “Pack Lite, Go Fast,” and it has been a good resource on how to do just that. 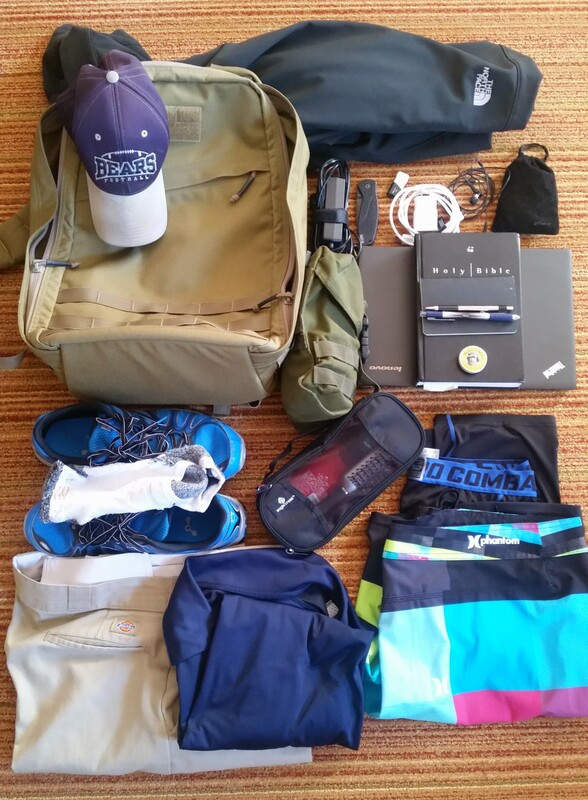 I got to try out my new packing style last week when I had to make a trip to Colorado Springs for some training. This training required a two day, one night stay and business casual clothes for each day. My goal for packing was three-fold. 1. Take two days worth of business casual clothes. 2. Take gear for two days worth of training while I was gone. 3. PACK LIGHT – nothing superfluous. Here is my packing list and picture. From Right to Left, Top to Bottom. GR1 Backpack, ball cap for training, Northface Jacket (it snowed on me one day), Computer charger, Kershaw pocket knife, flash drive, phone charger, head phones, bag o’ tech gear, Nalgene bottle holder, Lenovo X1 Carbon, Bible, Burt’s Bee hand moisturizer, Moleskin, Black & Blue pen, NB shoes and socks for training, Dopp kit, Dickies No-Wrinkle slacks, polo shirt, Nike Pro Combat undies, Hurley Phantom board shorts (used for training and swimming, and especially the hot tub) Not pictured was my workout shirt – it was still drying in the bathroom after being washed from my workout. I was wearing my other set of business cloths and nice socks & shoes. It worked well, I was able to take everything I needed and very little I didn’t. I was also able to keep up with my training regimen, something I’m not great at on the road. It was a good experience, and I plan to take one small backpack (GR1 or GR2, not sure which one) on my Asia trip in January. Separately, all of these things could appear chaotic, unrelated, or arbitrary. To me they are not. I want my life to be characterized by getting rid of things that I don’t need or things that slow me down or take away from my goals. (Reminds me of Hebrews 12:1-3 I guess) The older I get the more I like singularity of purpose as a lifestyle. Who knows how far I will get with that, I know I’ll never reach it. But to not strive for it is not in my nature. So I appreciate the guys who run companies and websites that motivate me to strive. Here’s to pursuing that elusive goal. Copyright © 2019 aarongiesler.com. All Rights Reserved. &vert; The Byline Theme by Alphabet Themes.